Turning your horse is a basic skill that you will learn as you first start to ride. While some riders regularly use neck reining, direct (or plow) reining is a more basic way to turn. Direct reining means you hold one rein in each hand. Your left-hand cues for a left turn and your right-hand uses the right rein to cue for a right turn. As you progress in your riding skills, you'll learn how to use the reins with more finesse, and to guide your horse more precisely. To start, learn how to cue your horse to do simple turns. Use thin riding gloves to improve your grip on the reins. With your horse saddled and bridled, you'll want to work in a flat obstacle-free area at first, then add obstacles as your skills improve. Try riding in circles, serpentines, and loops to learn to use your hand, seat, and leg aids and to keep your body in balance. Hold one rein in each hand. Your hands will be an inch or two forward of the saddle and several inches above, held so your fists are at a 30-degree angle. Your thumbs will be up, and the bight (buckle end) of the rein will be coming up out of the top of your hand. Hold the left rein with your left hand and the right rein with your right hand. Keep a gentle elastic contact between the reign in your hands and the horse’s mouth as you cue it to walk forward using your leg and seat. The reins shouldn’t be taut or drooping. There should be a straight line from your elbow to the bit. At the same time you cue with the reins, apply pressure with your left leg onto the horse’s side so the horse is turning around your leg. Don’t lean as you turn, but stay straight in the saddle, with your weight on your inside hip bone. As the horse obeys the cue, release the pressure of your hand and leg. Keep a gentle contact with your horse’s mouth until the next time you ask it to stop or turn. To turn right, use the right hand and leg to cue the horse in the same manner. Your right rein will now be the active rein, and you want the horse to bend around your right leg. Use the minimum pressure on the bit required to cue the horse. Harsh pressure on the mouth can upset a horse and make it insensitive to your commands. Never pull or yank suddenly. Avoid clenching too tightly with your legs. Not only will it make your legs and seat ache, but it may also confuse the horse. The more tightly clenched your leg muscles are, the tenser your entire body is. The horse will pick up on this tension and may react accordingly. When you're in the saddle, your weight should fall to your heel, as your leg hangs naturally. Reins constantly need readjusting as you ride. 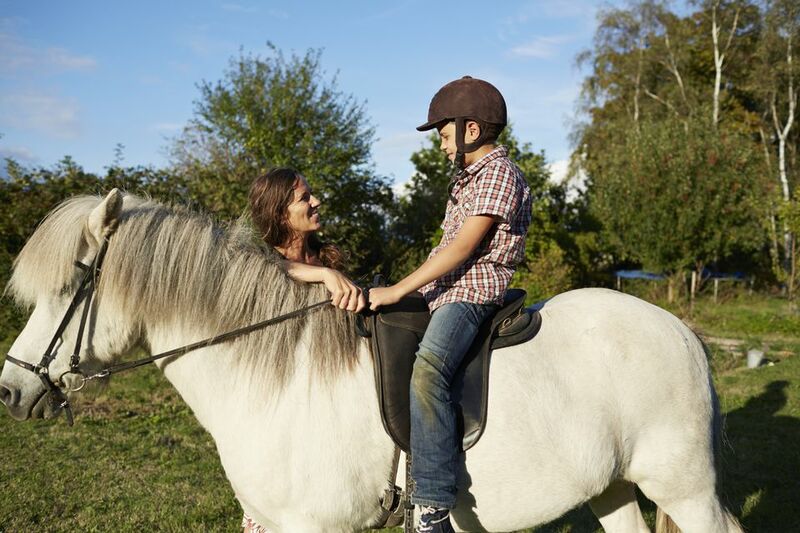 Always keep gentle contact on the horse's mouth by shortening or lengthening the reins according to the horse's gaits. This means shortening your reins as you go faster, and lengthening as you slow up, to allow the horse’s neck to move naturally. Learning to use the reins and aids properly will take practice until it becomes completely automatic. Don't grip the reins too tightly, because this confuses the horse, and over time it may learn to ignore the rein aids, or worse, react to the discomfort by rearing or pulling back. Many people think that the reins alone cue the horse to turn, but this isn’t entirely true. Seat and legs also come into play. Use schooling figures and obstacles like rails and pylons to practice turning around with accuracy.